As a new parent, you may not think about something as minor as a diaper pail, especially when you can throw the stinky diapers in the trash and dispose of them. Any mom who has already gone through the poopy diaper stage with their tot will tell you that having a good diaper pail is essential. This guide is designed to help you find the best diaper pail for your needs. The first diaper pail that we will be reviewing is the Ubbi steel diaper pail. It is a steel unit that is designed to keep the odors at bay and the rubber seals around the rim of the pail are airtight so that nothing seeps out. This unit is the perfect size. It can fit into small spaces near your baby's changing table, and it can hold up to 50 diapers at one. This diaper pail is designed with a slide open lid. Once the lid is closed, it can be locked in place until you are ready to use it again. In addition, the pail should be lined, but you can use any liner or trash bag inside of the unit. The unit is great at blocking smells and odors when the lid is closed. This compact diaper pail holds quite a bit of diapers. It does not have a very large footprint. You do not need to use special bags or liners with this unit. There is no foot pedal on this pail to open it, which means that you will need to lift the lid with your hands. The bag can be difficult to get out. The next diaper pail that we will be reviewing is manufactured from Munchkin. Since they are a company that is dedicated to the environment, they plant a tree each time that a Munchkin diaper pail is sold. The unit has a sleek design that includes a foot pedal for opening up the pail as well as a self-sealing system that is designed to help keep the air that you breath odor-free. In fact, this is one of the few diaper pails that does not welcome you with a whiff of diaper stench when you open the lid. The best part is that it comes with lavender bags and a lavender baking soda puck to keep the air fresh. It has a safety lock on the lid. ​This pail is great at keeping the odor to a minimum. It comes with scented refills. There is a foot pedal on the pail. You need to push the diapers through the self-sealing hole, which can get messy. The lid sticks a bit when you let go of the foot pedal. 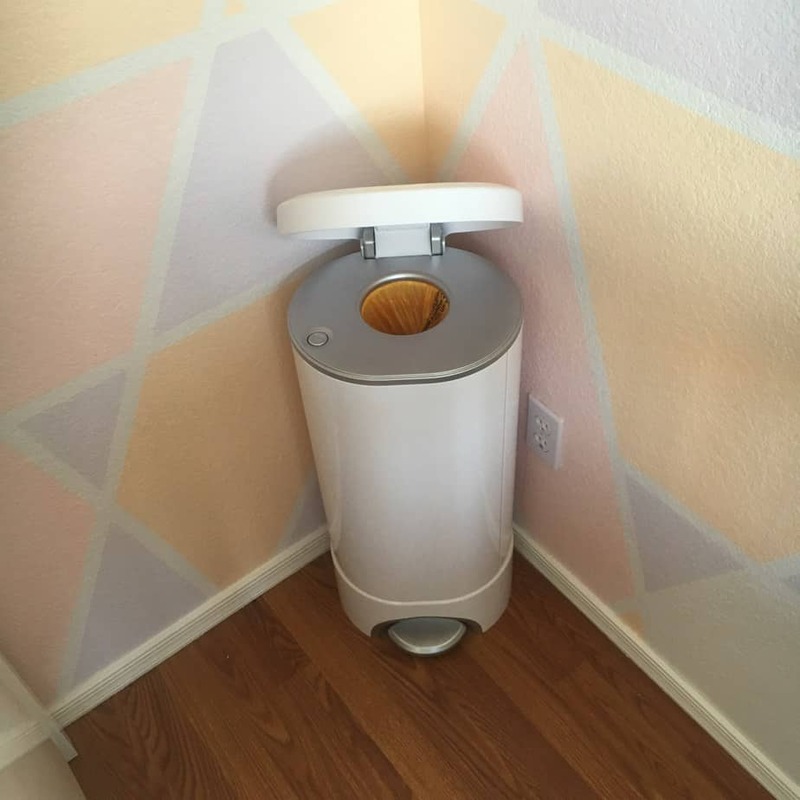 This Dekor diaper pail is another great option for a parent who is looking for a place to dispose of your baby's diapers that has a foot pedal. Once the lid is open, you will see a spring loaded door that is designed to keep the odors inside at all times. When you are ready to dispose of the diapers inside of the pail, there is an easy to reach access area that allows you to quickly dispose of the dirty diapers. The bags that are compatible with this unit are designed to offer continuous coverage, so when you remove the dirty diapers, you simply use the cutter in the bottom of the pail, and then tie a new knot at the bottom to secure the base of the new bag. The best part is that this unit is capable of holding up to 60 diapers at once, and if you need a smaller pail, there are other sizes to accommodate your needs. This diaper pail is great for containing odors. ​Changing the bag is extremely convenient. There are a number of color options available so that you can purchase a pail that matches the nursery. It holds quite a few diapers. It is difficult to tell how much bag is left on the refill roll. The liners are difficult to find. If you are looking for a diaper pail that is not going to cost a lot of money, then Baby Trend's Diaper Champ Deluxe is a great option for you to consider. One of the reasons that it costs a little bit less than some of its competitors is that it is only capable of holding up to 30 diapers. However, if you only have one kid in diapers, that is more than enough space. It is designed to keep the odors in the pail, and it does an excellent job. One thing of note is that you can use the refill liners that are designed for the pail if you'd like, but a 13-gallon trash bag will also be sufficient. 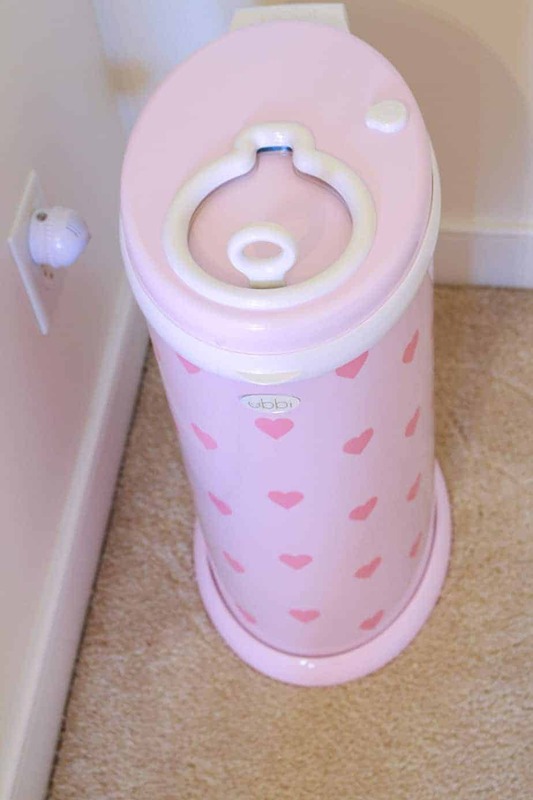 In addition, there is not a foot pedal on this diaper pail, but there is a space to put your foot to help hold it steady when you are removing the bag full of diapers. It keeps diaper odors locked away inside of the pail. ​This unit can utilize regular trash bags, which is extremely convenient. The hole that you put the diapers into is a bit on the small side. There is not a foot pedal on this diaper pail. The last diaper pail on our list is one that is designed specifically for cloth diapers. 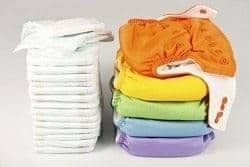 It would work for disposable ones as well, but the large opening makes it more convenient to quickly put the dirty cloth diapers into the pail. Busch Systems created this unit from recycled plastic to be as environmentally friendly as possible. The unit is designed so that it can be locked with two secure side locks that keep the lid from being removed with little hands. In addition, there is a filtration filter under the teddy bear icon on the lid of this device to help you get rid of the odors before they get too bad. It is made from recycled plastic material. ​It is great at locking the odors away inside of the pail. The clamp closures are quite secure. There is no foot pedal on this diaper pail, which means that you will need to open it with your hands. The carbon filter will need to be changed at least once a month. There are two types of diaper pails that you may need to consider before making a purchase. 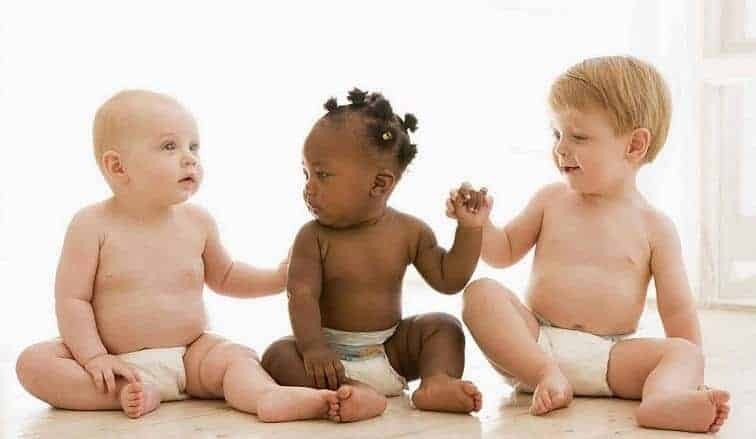 The type that you get will ultimately be determined by the type of diapers that you put on your child. If you use disposable diapers, then this is typically the best option. They can also be used with cloth diapers, but you may need to scrape the waste into the toilet before using this storage option. Wet diaper pails are specifically designed with cloth diapers in mind. It is essentially a pail that is filled with water so that the cloth diapers can soak until you are able to wash them. This is also a great way to remove stains from cloth diapers, but retrieving the diapers can be messier with this type of diaper pail. Most of the diaper pails that you can find are either made from metal or plastic. If you are on a budget, a plastic model is the cheaper alternative, but some can also absorb the dirty diaper odor. Metal options are more durable and do not absorb odors, but they will cost more. The entire reason that you are getting a diaper pail is to keep the smell contained, so you need to consider the odor containing features of the diaper pail before you make a purchase. Some diaper pails utilize scented liners to help mask the smell, while other models have charcoal air filters to help eliminate odors altogether. You are going to need a diaper pail that is easy for you to open with your hands full that is also very difficult for a young child to open. Dry diaper pails have liners in them, which is essentially a plastic bag that can be a danger to your baby. Wet diaper pails are full of water, which means that if a child can get into it, they could potentially drown. The best method for opening a diaper pail is a foot pedal, not only because it is safe, but because it is something that you can open with a baby in one hand and the dirty diaper in the other. 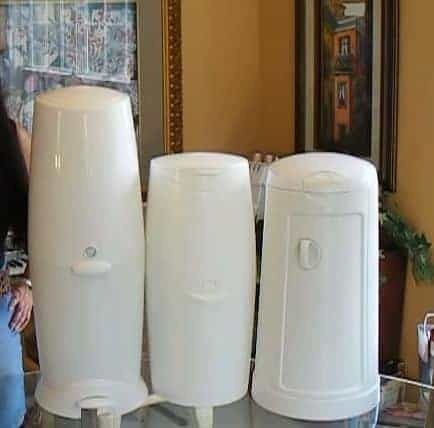 You want to find a diaper pail that can hold more than one or two diapers so that you are not disposing of them constantly, but you also don't want to have one that never fills up so that the odor has less of a chance to linger. If you have a dry diaper pail, using liners will help to reduce the poop smell that lingers behind after you remove the diapers. Always wrap up the diaper tightly before you put it inside of the diaper pail. When the waste is sealed as tightly as possible, the odor will not travel outside of the diaper. If you have an odor issue, adhere an air freshener to the lid, or if you prefer, you can put a little bit of baking soda in the bottom of the pail to absorb the odor. Make sure that you empty the diaper pail frequently so that there are no lingering odors. Clean the diaper pail frequently. Baking soda is an excellent way to remove odors, and creating a paste helps get into all of the imperfections of the plastic material where the odor may be lingering. As you can see, there are a number of different options that you can choose for your diaper disposal. The pails that we have reviewed here are all great options, but the one that you select depends on your needs. If you have triplets, you are not going to purchase a small pail that a mother of one may. If you are looking for a recommendation, then the Ubbi Steel Diaper Pail is the one that comes in above the rest. It holds quite a few diapers, it has rubber seals to keep the odors at bay, and it has a child-proof lock to prevent them from opening the diaper pail.